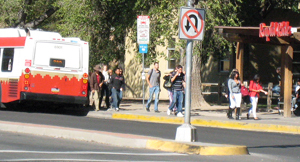 The Mid-Region Council of Government is conducting a public transit study of the Univeristy of New Mexico, Central New Mexico Community College and the Sunport area in Albuquerque. The project evaluates transit, parking services and land development in the immediate area of UNM, CNM and the Sunport. The project includes UNM's North, South and Central campus areas along with the immediate neighborhoods. The purpose is to develop both near and long term transit, land use and parking strategies to improve transportation in the study area. MRCOG representatives will seek public input in two public meetings. On Monday, Oct. 22, the public is invited to the Loma Linda Community Center at 1700 Yale Blvd. NE from 6 p.m. to 8 p.m.
A second meeting on the UNM campus will be held on Tuesday, Oct. 30 from noon to 1 p.m. at the Student Union Building on campus in Lobo Rooms A & B. Feedback from people attending the meetings will be used to begin development of potential solutions. For more information, visit: MRCOG. For questions contact Tony Sylvester at (505) 247-1750 or tsylvester@mrcog-nm.gov.